KNB-17 : 7.5 volt 1500mAh rechargeable Ni-Cd battery pack - fits KENWOOD TK280, TK290, TK360, TK380, TK390, TK480, TK481, etc. Home > Commercial-Land Mobile-Marine > KNB-17 : 7.5 volt 1500mAh rechargeable NiCd battery for KENWOOD. Replaces KNB-17N, etc. KNB-17 : 7.5 volt 1500mAh rechargeable NiCd battery for KENWOOD. Replaces KNB-17N, etc. The KNB-17 is a 7.5 volt 1500mAh rechargeable NiCd battery pack - fits KENWOOD TK-190, TK-280, TK-290, TK-360, TK-380, TK-390, TK-480, TK-481, TK-5400 radios, etc. 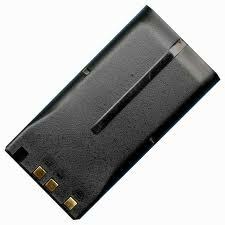 Replaces original battery models such as KNB-17N, KNB17N, KNB-22N, etc. The battery power contacts are IN LINE on the face. Battery can be re-charged with OEM desktop chargers, as well as our EMS-15-43 Rapid Charger. EMS-15-43K: Desktop Rapid Charger for Kenwood battery packs such as the PB-43N, PB-43h, KNB-14N, KNB-15N, KNB-17N, KNB-22N, etc. Charges both Ni-Cd and NiMH.